Irvine Scientific, a world leader in cell culture media development and manufacturing today announced the expansion of its manufacturing facility in Santa Ana, California to increase overall dry-powder production capacity. 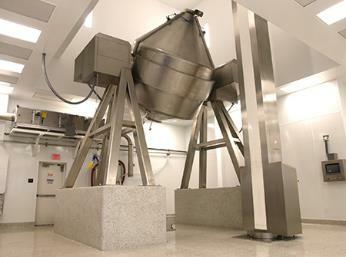 The expansion was multistep and included: more space dedicated to its animal component free (ACF) dry powder production area, additional impact milling capacity, the addition of a large-scale, pharmaceutical grade blender, and higher throughput cleaning capacity of the ACF dry powder portion of the facility. As one of its fundamental business offerings, Irvine Scientific performs large-scale cGMP manufacturing of dry powder media for the biopharmaceutical, vaccine and cell therapy industries. The expansion provides tumble blending capacity of 12,000 L total dry volume. This additional capacity enables the company to provide customers with homogeneous, high-quality powder media in single production batch sizes of up to 7,000 kg. The new large-scale blender is based on the same proven, tumble blending technology Irvine Scientific currently uses, which protects delicate raw materials and produces extremely reproducible results. The enhanced cleaning capacity is performed using a closed-loop, wash-in-place system that minimizes the risk of environmental or carry-over contamination between batches. Rigorous testing and cGMP validation studies have been conducted to ensure media produced in the largest batch sizes possible meet the same high quality standards Irvine Scientific currently delivers to its customers. As a critical element of media quality, blend homogeneity, was proven by measuring the percent relative standard deviation (% RSD) of component concentrations in multiple batch sizes from powder samples taken from various locations in the blender. Homogeneity in the largest batch sizes was <6% RSD during validations which demonstrates that the powder homogeneity in the new blender meets the same high-performance standards previously established by existing Irvine Scientific powder manufacturing processes.